The tides of change are sweeping over Reading List, and this little corner of the blogging world, again. And I am sorry to say that this little weekly group is nearing it's end. 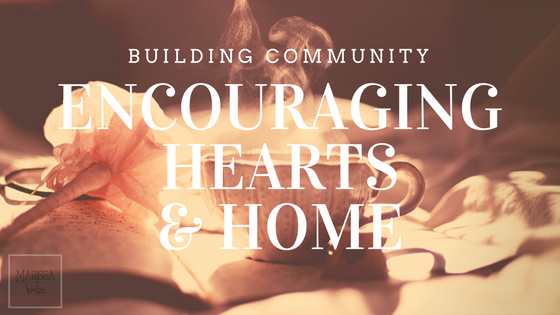 I'm sure many of you have noticed that my focus is changing, and narrowing... needless to say, I will no longer be part of Encouraging Hearts & Home come November. The link up will continue on, or so I am told, so feel free to bookmark one my co-hosts and follow along to stay with this group. But I'd also love for you to continue to follow my writing and book journey. So consider joining our newsletter, which will continue to arrive in your mail box on Thursdays (most of the time). There will be community freebies there still. Did you see the update above? All the best to you with your blog and your book. Sorry to see you leave Marissa, I have enjoyed sharing with you through this link up. I'm glad you will still be writing.